We talked to the co-founder of Lindy KL Lionel Tan and Argentinian dancer Juan Villafane about the origins and modern resurgence of the Lindy Hop dance. Lindy Hop is a fast-paced dance originating from Harlem, New York in the ’20s. Prominent among the African-American community of that era, Lindy Hop is a fusion of many dances that incorporate elements of jazz, swing and tap. Fast forward several decades later, the dance has seen a revival across the globe and more recently has found its way to Malaysian shores. Lindy KL is a growing dance community co-founded by Lionel Tan that offers weekly classes and workshops for anyone interested in the dance. It occasionally invites international professional instructors to showcase their skills too. One such guest is Argentinian instructor and dancer Juan Villafane, who will be in Malaysia for the second time this September to collaborate with Lindy KL to perform and teach the dance. Lindy Hop originally started out as a social dance, or as Villafane calls it, ‘the people’s dance’. Jazz started becoming popular in the ’20s, attracting a young audience as it was considered ‘new music’ at the time. ‘They [the young people] were intrigued by the music and because of the harsh circumstances that the African-American community endured at the time, they improvised a dance that matched the catchy tunes of jazz as a way of “surviving” as a community,’ says Villafane. Although the dance saw a resurgence in the ’80s, the music that we’re used to associating with Lindy Hop nowadays only made a comeback in the late ’90s. ‘The music that we’re thinking of here is “New Swing” which has elements of ska and a bit of rock, inspired by the punk bands of that era,’ says Villafane. ‘Although the dance has gone from being a street dance to a studio dance, Lindy Hop still holds much of its spirit as a social dance, formed from hardship and political unrest,’ he continues. 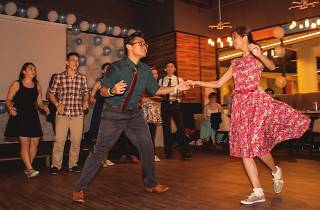 Lindy Hop is typically fast-paced, but it can also be slow and anywhere in between. ‘Back when the dance fi rst started, there was a spirit of competition that came along with it and people would push each others’ boundaries – when the tempo of the music accelerated, so did the moves. Later on, “acrobatics” were added to the dance, which are called “air steps”. But I also learnt that Lindy Hop can be reverted to how it fi rst began, with slow movements without any “acrobatics” thrown in,’ says Villafane. Over the years the dance has travelled across the globe and is slowly becoming popular wherever it lands. ‘You can go anywhere in the world and not be able to speak the language, but with dance, everyone speaks a common tongue. 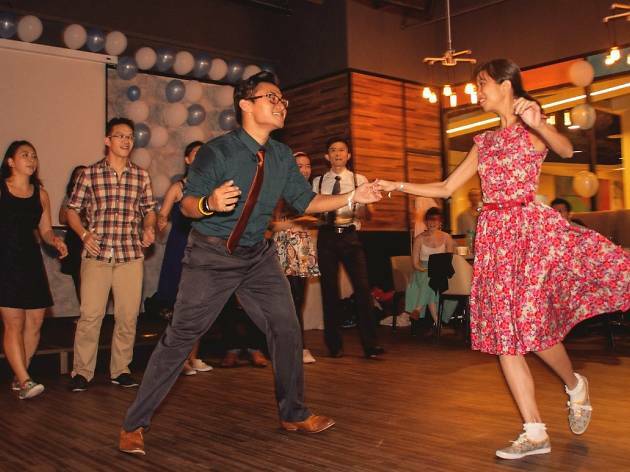 Lindy Hop creates a bond with you and your partner – you could be dancing with that person for the fi rst time but for some reason, something just clicks between the two of you,’ says Tan. Lindy KL frequently hosts classes, workshops and meet-ups for anyone who enjoys the dance; each event usually sees a good 40 to 50 people turn up in fancy clothing to strut their stuff . But Tan thinks that it can still get better. ‘Swing dancing started taking off in Malaysia in 2008, but we had a hard time getting people to join our community. Although the numbers have improved now, the dance still remains a niche to KLites. We occasionally organise more public events, usually held at Publika, to spread awareness about the dance,’ says Tan. Classes available through Lindy KL, New Star Studio, 65-1 Jalan 109E, Taman Desa, KL (fb.com/lindyKL) and KL Swing, Twenty20Two, 20 & 22 Jalan SS4D/14, Taman Peoples Park, PJ (fb.com/klswing). Visit their websites for more information and rates on classes.